Not everyone needs a massive compressor that is able to deliver air at an insane rate. Sometimes you just need something that will help get things done around the house a little bit quicker. While I was scavenging the net for the best compressors, I came across some of the pancake-style compressor models. I discovered these are quite sought after by people and, for a good reason since they have a lot of things going in their favor. The first plus is portability. This type of compressor is often compact, light and portable, so you can transport it from one location to another without any hassle. Pancake-type compressors will handle most household repairs with ease. Stuff like nailing, spray painting, and inflation etc. is done in no time with one of these. There are plenty of such compressors out there, but I managed to single out several. 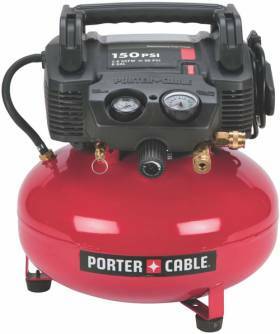 In the following few words (or more), I am going to take a closer look at the Porter-Cable C2002-WK UMC Pancake Compressor which is oil free. It ticks all the boxes I just described above, plus it comes with a huge 13-piece accessory kit! This unit can deliver 90 PSI of pressure at a rate of 2.6 CFM, and a maximum pressure of 150 PSI for extended work. It comes with an air coupler and a plug which are pre-installed on the air hose to save you the trouble of installation. However the handiest thing about this is it’s there to prevent air leaks. Ensuring you always have a continuous amount of pressure is the 5 gallon pancake-style air tank. The tank has a water drain valve which is a nifty feature because it lets you get rid of moisture that builds up inside the compressor over time. Also, the tank has rubber feet to help protect your floors from scratches. The 120-volt motor has a low amp draw which makes it suitable for operation in cold weather conditions plus, you can attach it to an extension cord without any problems. It wasn’t easy to find out how much horsepower this little unit has to offer, but after some research I discovered it’s 0.8. Now I have come across this next bit a lot on these portable compressors, and I’m talking about the oil-free pump. You see an oil-free pump doesn’t require any oil to run (obviously), so the maintenance process is much simpler or should I say, non-existent! The motor inside this air compressor has brushes which are replaceable and extend the life of the unit significantly. Also, the motor is capable of “soft starting” which means you can connect it to the house mains without the unit becoming overloaded. It’s very light, weighing just 34lbs, and with measurements of 18.3 x 18 x 19 inches, it’s extremely compact and (of course) portable. It is especially convenient for use in small spaces where there is a chance you might trip over the unit and hurt your-self. I’ve already mentioned the oil-free pump. Whereas heavy-duty compressors require an oil-lubricated pump for cooler operation, light compressors like this one are much better off with an oil-free pump since it requires nearly zero maintenance. No messy oil replacements here! After all that heavy reading above (especially if you’re not technically minded), here comes the interesting part. As I’ve said this unit comes with a massive 13-piece accessory kit which has all the bits you need to fully take advantage of the compressor’s versatility. You get a 25-foot hose, tire gauge, blow gun, tire chuck, and a whole bunch of other attachments. I think this is a great addition kindly added by the manufacturer because it saves you the bother of having to spend extra. This Pancake Compressor is small, highly portable and powerful enough to handle all types of household repairs and renovations. If you want an air compressor that’s easy to use, I think this one is definitely worth considering. Plus, the accessory kit is an added bonus. The only minor complaint I have is the noise it makes, but it’s hardly a con since this is a power tool. The manufacturer is known for its quality products, and this compressor is no exception. It’s good value for money, too. No “pressure”, but if you are interested in taking a closer look, pay a visit to Amazon and get one for yourself.